Mountain biking is a fun and healthy activity that's great for everyone in the family. Mississippi is full of beautiful natural areas that make perfect trails for biking. Here are our top nine mountain biking trails in the Magnolia State! Mt. Zion Bike Trail in Brookhaven is arguably the favorite trail of mountain bikers across Mississippi. The main trail here covers about nine miles and offers plenty of berms, wooden bridges, jumps, and more. You can also choose the six-mile track, two-mile beginner loop, or the kid-friendly one-mile loops. And at the end, enjoy a complimentary popsicle! If you're looking for a place to ride near the University of Mississippi, try Clear Creek. This single track trail is well-maintained and offers a challenging eight miles of steep terrain changes and other obstacles. Keep an eye out for "The Big One,” a switchback that really sets this trail apart. The Ridgeland Trails are a go-to for anyone in the Jackson area. The six miles of track have separate sections for various skill levels, so everyone can enjoy the trails here. You'll have to purchase a membership. However, two-day memberships are available. Homochitto National Forest is a beautiful park between Natchez and McComb. 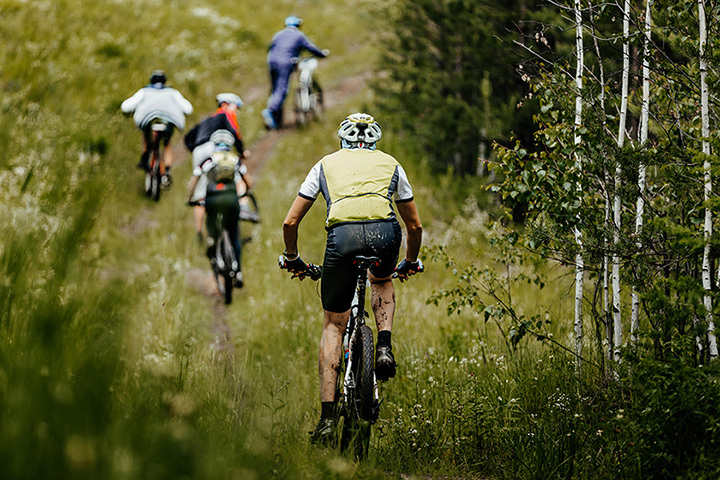 The park offers more than 20 miles of mountain biking trails, known as the Clear Springs Mountain Biking Trail System, making this the perfect destination for a weekend-long camping trip. If you're looking for a brand-new trail that's been built on a sprawling park bordered by a river, well, you're in luck. The Petal River Park Trail has short, steep hills and plenty of beautiful scenery. This is a great place for a casual ride for beginners! Bayou Point Public Use Area is located in Coldwater near the Arkabutla Dam. This five-mile track is well-maintained and offers beautiful views of Arkabutla Lake. The trail offers different experiences when ridden clockwise or counterclockwise. Another popular place to bike in the Ole Miss area, Fruit Loops and Railbed are part of a larger network of pathways near campus. The tracks are known for being fun to ride with plenty of turns and good speed. The Bonita Lakes Trail is a moderately difficult loop just outside of Meridian. The scenery here is some of the best you'll see on a bike, and there are also a number of auxiliary trails in the area. Be sure to bring a picnic to enjoy by the lake! If you live on the coast and you're looking for a mountain bike trail, visit the Bethel Mountain Bike Trails in DeSoto National Forest. At just over nine miles, this track offers enough of a ride to get your heart rate going, but it's still easily travelled by riders of any skill level.